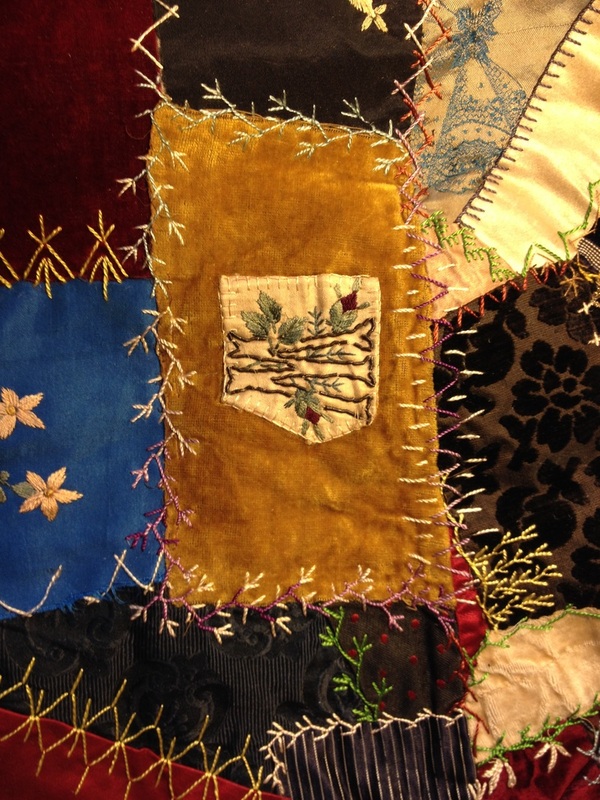 Why is a Crazy Quilt Like A Valentine's Day Card? At left is a quilt, dated 1889, from our permanent collection. 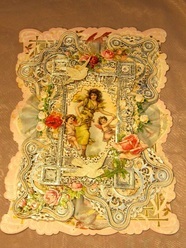 This wonderful piece was made by Elizabeth Evelyn Winman Newcomb (known as Dot). 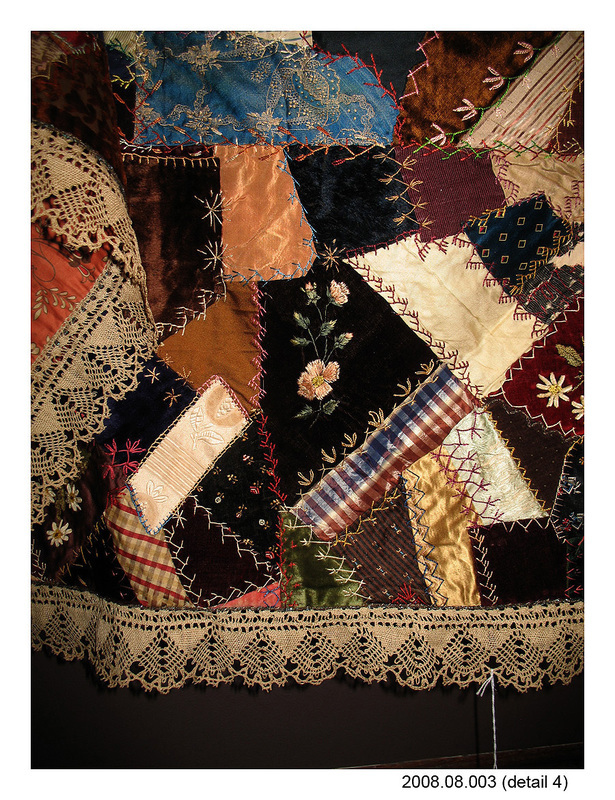 This is a beautiful example of a Victorian Crazy quilt, embellished with embroidery, ribbon, chenille and floss done in a variety of stitches. A few of the pieces are painted. A thin, metallic edging and an wide ecru bobbin-lace border surrounds all four sides. The bobbin lace edging was made straight and is gathered to turn the corner. 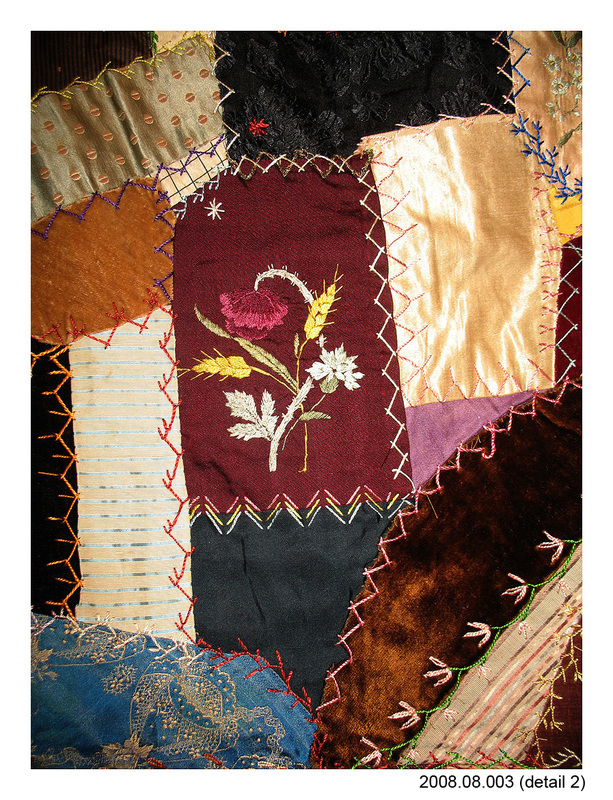 The backing is an orange cotton chintz with a stylized bleeding heart print. 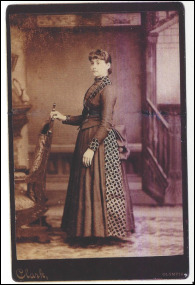 Elizabeth was born in Ontario, Canada in 1870 and moved with her family to Olympia in 1876. 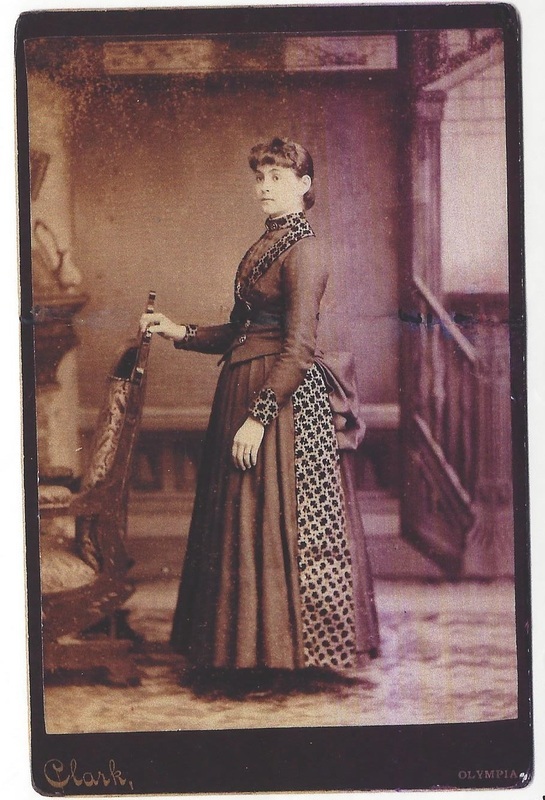 In 1891 she married John S. Newcomb, a doctor. They had a daughter in 1892, Charlotte, who was born a month premature on Christmas Day. Both Elizabeth and her daughter suffered convulsions during the birth and in 1901 Elizabeth was struck with convulsions again when her husband was away and she died at the age of 31. Elizabeth had a great love for her garden and was known to have a green thumb. 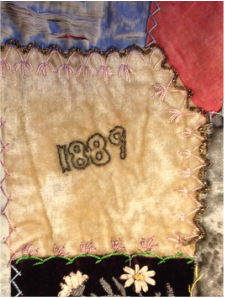 At age 19, before she was married, Elizabeth marched in the Olympia parade to celebrate Washington becoming our 42nd state, which is perhaps why the date of 1889 is embroidered in the center of this beautiful quilt. 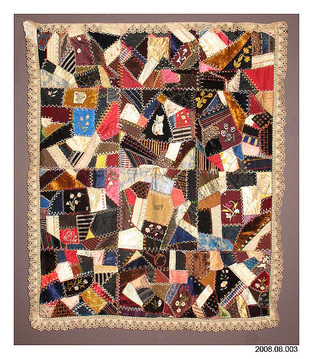 Did she make this quilt to commemorate the occasion? 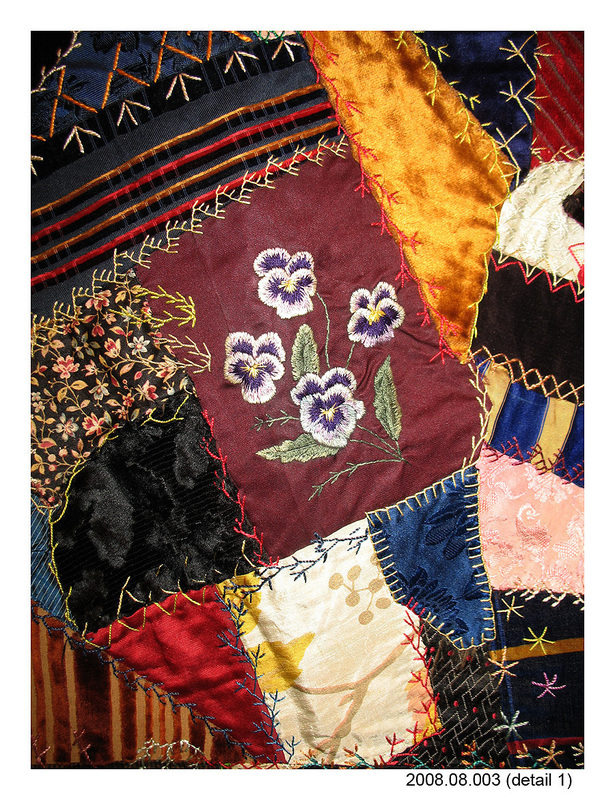 Other decorations on the quilt are many different flowers, a precious kitten, a fan, and a small child. 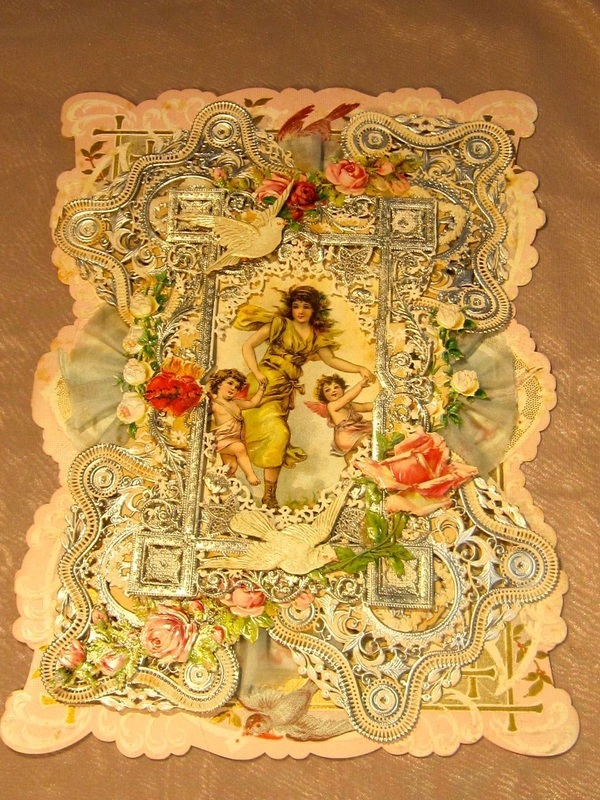 With its beautiful textures of satin, silk, velvet and the wonderful variety of decorative stitches, embroidered and painted flowers, kittens and babies, this exquisite piece of Victorian art reminds us of a Valentine's Day card from the same era. 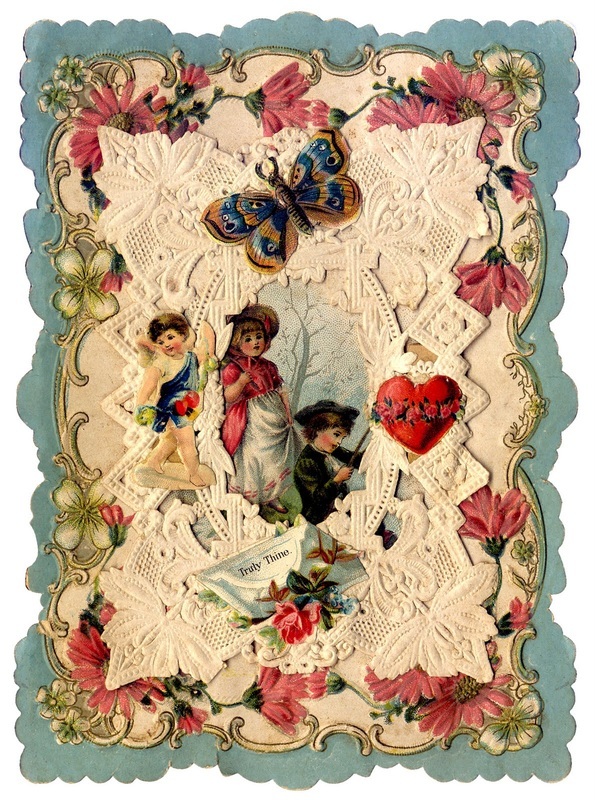 The majority of early Victorian Valentines were customarily made by hand from honeycombed tissue, watercolors, paper puffs, colored inks, embossed paper hearts and exquisite lace. 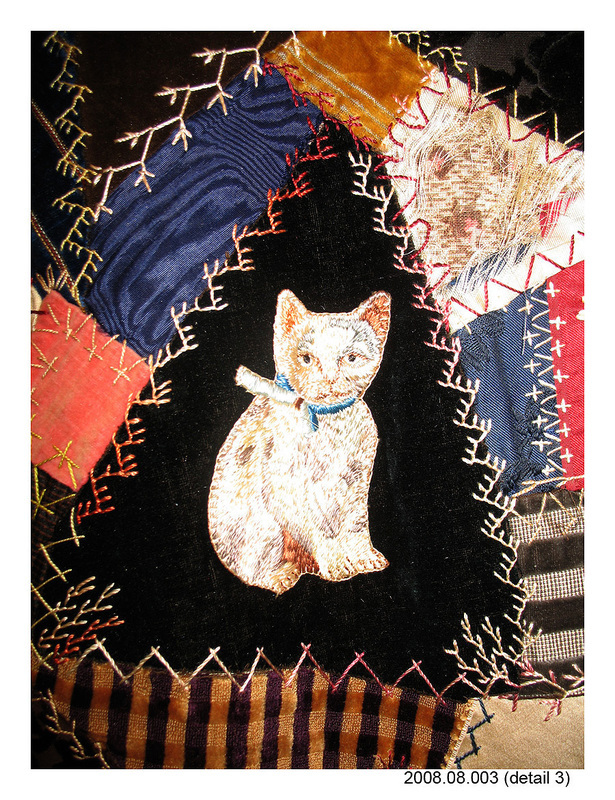 They were truly beautifully-created small works of art, often adorned with silk or satin in addition to lace, flowers or feathers, and even gold leaf. Such fragile honeycomb designs remained in vogue until around 1909. 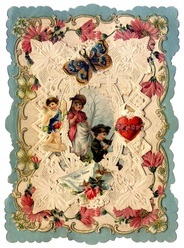 Hallmark did not begin to offer Valentine's Day cards until 1913 and began producing them in 1916. 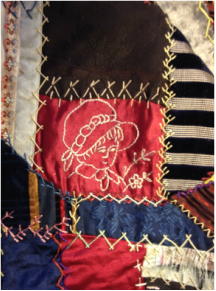 Thank you to Elizabeth's family - her daughter Charlotte, and her grandson Richard Parker - for sharing so much information with us about her life and helping to preserve the stories behind this beautiful quilt.